The home improvement world is full of trends. Shiplap siding, farmhouse sinks, subway tile—it can be hard to keep up with the latest when it changes so often. But there are some trends that are less about looks and more about safety and health, and the composition of your kitchen cabinets is a perfect example. More and more homeowners are choosing formaldehyde-free kitchen cabinets. That’s because the cabinets made from pressed wood like particle board, hardwood, plywood paneling, and fiberboard typically contain formaldehyde. That’s a problem because formaldehyde is considered a VOC, or volatile organic compound. VOCs “off-gas,” which means they evaporate from their source and linger into the air we breathe. The federal government regulates formaldehyde as a carcinogen, and the Environmental Protection Agency considers it a significant source of indoor air pollution. Exposure to formaldehyde and other VOCs can cause watery eyes, a burning throat, headaches, other flu-like symptoms, difficulty breathing, and dizziness. 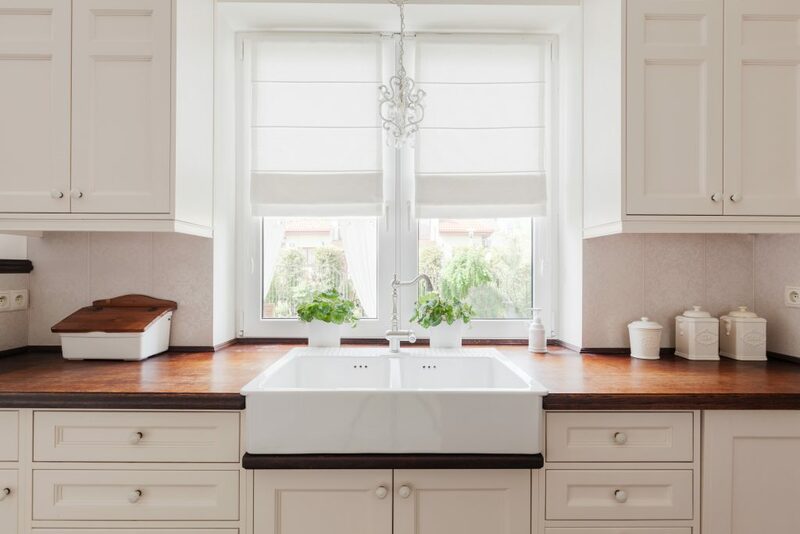 Whether you’re replacing existing cabinets or furnishing a brand-new kitchen, here’s what to look for to avoid cabinets that contain formaldehyde. Cabinets made from pressed wood products—and especially those made with conventional particle board or medium-density fiberboard—are risky because they’ve most likely been produced using a urea-formaldehyde binder. In addition to off-gassing the chemicals they contain, these types of cabinets are particularly susceptible to moisture and could swell or develop a mold problem. At the very least, avoid putting them in your bathroom or another room where the humidity is high. Solid wood cabinets are a much safer choice than cabinets made from pressed wood products. Wood products labeled CARB compliant are also a safer bet, as they meet the standards for reducing indoor air pollution set by the California Air Resources Board. The CARB product emission standards are the lowest in the world. 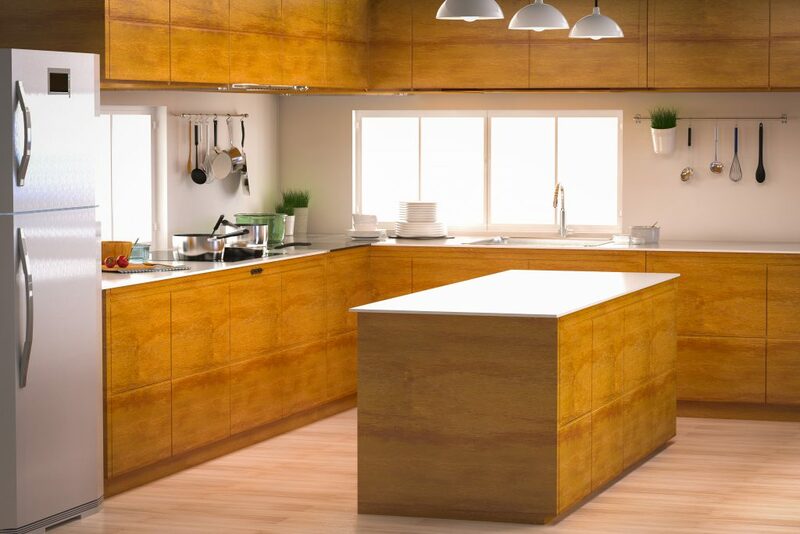 The Kitchen Cabinet Manufacturers Association has developed an Environmental Stewardship Program that acknowledges manufacturers for producing low formaldehyde-emitting wood products, among other criteria. Cabinets displaying the KCMA Environmental Stewardship Program (ESP) certification seal must use at least 80% CARB compliant pressed wood. Custom cabinets are the most expensive option, but they’re probably also the healthiest. You can work directly with your carpenter to choose the wood and finishes to ensure that the carpenter meets your priorities for no formaldehyde and no- or low-VOC stains and finishes. Plus, you can create a manufacturing and installation schedule that makes certain that the cabinets are not installed until they are completely dry and odor-free. Buy used cabinets that you can repaint and reseal using no- and low-VOC paints and sealants. If solid wood cabinets aren’t in your budget, consider used cabinets that you can reseal or paint safely. Because cabinets off-gas over time, older cabinets at some point will off-gas relatively little formaldehyde. The key at that point is to refinish them using a safe product that won’t revive the problem. In terms of costs, probably the most expensive option is to have cabinets custom-made to meet your design and air quality needs. The cost of buying formaldehyde-free, low-VOC cabinets “off the rack” will vary depending on the manufacturer, the style of cabinet you choose, and how many cabinets you buy. Refinishing used cabinets with no-VOC stains and paints is the least expensive option if you do the work yourself, but it’s also the most time consuming. Neil Kelly Cabinets –These cabinets meet LEED (Leadership in Energy and Environmental Design) criteria for sustainability, as they’re made with non-toxic low-VOC finishes, eco-friendly adhesives, and resource responsible wood veneers, as well as being free of urea formaldehyde components. Breathe Easy Cabinetry – These cabinets are constructed of sustainably harvest wood, formaldehyde-free plywood, and non-toxic glues and finishes. Stains and paints are low- and no-VOC and Green Seal and/or Greenguard certified. The clear top coat is water based. Bellmont Cabinet Co. – These cabinets use a particle board that meets the Composite Panel Association (CPA) Environmentally Preferable Product (EPP) specification for low formaldehyde emissions. In addition, the same material is manufactured with 100% fiber that is recycled, recovered, or both. Their EcoCore option has a pine core particle board interior that contains no urea formaldehyde. Ikea – Ikea’s cabinets are CARB2 compliant, so they meet the California Air Resources Board’s standards for low-formaldehyde emissions from engineered wood. One note: if you choose these (or any particle board cabinets), make sure they are sealed around the edges. That way, whatever resins are used to hold the particle board together will be trapped and release fewer VOCs overall. If you’re refinishing cabinets, choose no-VOC paint and stains. In addition to the wood itself, paints, stains, and varnishes may contain formaldehyde and other VOCs that can off-gas. Pay attention to both the wood and the finish when getting new cabinets. If possible, refinish cabinets outside, rather than in your house, and give them plenty of time to completely dry before installing them. If you can still smell an odor on them, it’s too soon to install. Regardless of the kind of cabinets you choose, it is a good idea to ventilate the room where they’re being installed. Keep windows and doors open if possible and run a fan to circulate the air. You can also set up an air monitor to keep track of indoor air pollution levels that could cause immediate or future problems. Homeowner 101: How to Paint Brick, Cement, Laminate, or Metal	Homeowner 101: How to Grout and Tile a Backsplash	Pet Proof Your Home Renovation	Does No-VOC Exterior Paint Matter?